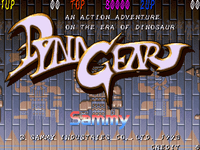 Play a character in a powered assault suite in the land of the dinosaurs. Fight, shoot and gain powerups to defeat opponents and bosses. Future meets past in this scrolling fighter/shooter.